Regional Command South (RC South) is comprised of six provinces: Nimruz, Helmand, Kandahar, Zabol, Urozgan and Day Kundi. RC South spans roughly 78,000 square miles, making it slightly larger than Nebraska, and shares a 550-mile border with Pakistan. The terrain throughout southern Afghanistan is mostly flat and arid. Nimruz, Helmand and Kandahar are predominantly vast, flat, hard-packed desert. The provinces of Uruzgan and Zabol have mixed flat and mountainous terrain, while Day Kundi is mountainous. Helmand and Kandahar are the two largest and most populated provinces, and their population is concentrated along two major rivers, the Arghandab River and the Helmand River. Kandahar—Afghanistan’s second largest city with a population of half a million—is the political and economic center of the South. The southern region of Afghanistan is predominantly ethnic Pashtun, but there are small minorities of Hazaras in the northern areas of Day Kundi, and Baluchis on the very southern edges of the region. Most of Afghanistan’s greatest leaders originated from the south. Ahmad Shah Durrani, regarded as the founder of present-day Afghanistan, established a kingdom in Kandahar province in 1747, although the capital was later relocated to Kabul. The Durrani dynasty ruled Afghanistan until 1973.1 The province of Kandahar was also the birthplace of the Taliban in 1994.2 The strong, hierarchical tribal system in the south has typically hindered social, economic and political reforms in the region. In Kandahar province, the Arghandab River flows south from the Afghan central mountains, passing just north of Kandahar City. Together with its various tributaries, the Arghandab irrigates the greater Kandahar area—including the Arghandab Valley, northern Panjwaii, Zhari and Maywand—before continuing westward to join the Helmand River immediately south of Lashkar Gah. The Registan Desert lies south of Kandahar and the Arghandab. To the north, foothills and mountains of the Afghan central mountains separate Kandahar from Oruzgan province. A highway runs southeast from Kandahar to the Spin Boldak-Chaman border crossing and thence to Quetta, Pakistan. The Kandahar to Kabul section of the Afghan Ring Road stretches east and northeastward from Kandahar into Zabul and then Ghazni provinces. The Helmand River is the longest river in Afghanistan, stretching over 1,000 kilometers. It descends from the Hindu Kush Mountains in Wardak Province, west of Kabul – passing through Bamyan, Uruzgan, Helmand, Nimruz and crossing into Sistan and Baluchistan Province of Iran. In Helmand Province, the Helmand River Valley stretches from the Kajaki dam and reservoir in the northeast to the river’s junction with the Arghandab below the provincial capital Lashkar Gah. The Helmand River Valley in the central part of the province is characterized by irrigated, populated zones on either bank. From north to south, the principal river towns are Kajaki, Sangin, Gereshk and Lashkar Gah. In the northernmost districts of Helmand, where the terrain turns to foothills and mountains, the towns of Musa Qala and Naw Zad are situated further from the river, in tributary valleys. The Afghan Ring Road, after departing Kandahar, runs westward to Gereshk on the Helmand and continues on to Delaram, situated at the Farah, Nimruz and Helmand tri-border area. Below Lashkar Gah, the lower Helmand Valley continues from the Arghandab river junction south and then west toward Nimruz province; the extent of irrigated lands along the river’s banks decreases as it progresses into the Dasht-e Margo (Desert of Death) on its way toward the Sistan Basin in Iran. The terrain transitions rapidly to desert on leaving the immediate river valley zone. ISAF’s Regional Command South headquarters is based in the city of Kandahar. Canada, Britain, and the Netherlands rotate command of RC South. The Netherlands currently command RC South, under the leadership of Major General Mart de Kruif.19 In 2009, a UK division headquarters, under the command of a British two-star general, will be installed at the Kandahar Air Field. Approximately 19,000 Afghan National Security Forces (ANSF) – Afghan National Army (ANA) and Afghan National Police (ANP) – are stationed in the region.23 The ANA’s 205th Corps operates RC South, with a brigade each in Helmand, Kandahar, Urozgan, and Zabul. There are four Provincial Reconstruction Teams (PRTs) in the south. They are in Kandahar City, Kandahar Province (led by Canada); Lashkar-Gah, Helmand (led by the United Kingdom); Tarin Kowt, Uruzgan (led by the Netherlands) and Qalat, Zabul (led by Romania and USA). There is no PRT in Nimruz. Kandahar province lies in southern Afghanistan, bordering Pakistan to the east and south. Most of the province is flat or semi-flat desert, although the northern part of the province is mountainous. Kandahar province is divided into sixteen districts. The province has a population of over 1,000,000 people.25 Roughly 250,000 live in the provincial capital, Kandahar City.26 A majority of the population lives in rural areas. The province is overwhelmingly Pashtun and 98 percent of the population speaks Pashto. Of the Pashtun, the Durrani and Ghilzai tribes form the majority. Small numbers of Baluchis, Hazaras and Tajiks also live in Kandahar. Kandahar remains one of the most volatile provinces in Afghanistan, and some of the province is controlled by elements of the Quetta Shura Taliban. Kandahar is a strategically important province for the Taliban. The Taliban was created in Kandahar province in the early 1990's. They are now based in the nearby Pakistani city of Quetta, where their leaders meet in a Shura council. The favorable terrain allows for their preferred fighting tactics. Insurgents can easily transit across the desert routes and hide in the orchards, vineyards, and rocky terrain. The Taliban in Kandahar province conduct suicide attacks, roadside improvised explosive device and landmine attacks, and ambushes. The Taliban target ISAF, ANA and ANP Forces along the ring road. Endemic corruption and criminality fuels the insurgency and undermines the effectiveness of the security forces, particularly the local police. The western districts of Panjawayi, Zherai and Maiwand are particularly problematic and therefore are a primary focus of ISAF Forces.27 Although themselves relatively more peaceful then the volatile western districts, Ghorak, Khakerez, Shah Wali Kot and Mianshit are unstable and provide transit routes for insurgent operations. Arghandab district is one of the most troublesome in Kandahar because of the level of insurgency and insecurity. The Taliban have taken control partial of complete control of the strategic district as they see it as a gateway to the city of Kandahar. It is strategic terrain given its proximity to Kandahar city (it is only fifteen kilometers to the north). It also offers natural defenses. Insurgents can hide from the air attacks of the ISAF Forces in the district’s fruit orchards. Canada, which forms the largest contingent of ISAF Forces in the area, has suggested that it may withdraw its troops from Kandahar by 2011. Kandahar remains one of the most undeveloped provinces. Only 27 percent of households have access to electricity, and only two percent of households in rural areas have electricity. Agriculture is the main source of income for a quarter of the population. Kandahar province produces tobacco, cotton, watermelons, grapes and nut trees, as well as opium. The province is the second largest opium poppy-producing province in Afghanistan, after Helmand.29 The province cultivated 14,623 hectares of opium in 2008, although a reduction is expected in 2009. Helmand is unstable. The northern districts of Nawzad, Musa Qala, Sangin Qala, Baghran, Washeer and Kajaki were vulnerable to insurgent attacks targeting ISAF, ANA and ANP forces from 2006 onward. The attacks have resulted in a large number of casualties. ISAF and Afghanistan security forces lost control over these districts.32 Due to the lack of Coalition or Afghan forces, small militias function as reserve police in the northern part of the province. The militias are said to be implicated in drug crimes, frequent lootings, and killings.33 There is currently no program to disarm these groups. The section of the Ring Road in the province is frequently targeted by insurgent attacks and bandits.34 Criminality is prevalent. Five out of thirteen districts of Helmand are under virtual control of insurgents. Three others have only minimal presence of government and Coalition Forces.35 The Garm Ser district in the south has seen a large number of insurgent attacks during the past two years. ISAF and the government also lost and fought to regain control of the Garm Ser district several times. Fierce fighting between ISAF and insurgents is also common in the Greshk district. There have been many civilian casualties as a result of suicide bombings, but also ISAF airstrikes. Located in southwestern Afghanistan, Nimruz Province borders Iran’s Sistan and Baluchistan Province in the west and Pakistan’s Baluchistan Province in the south. The province has a population of about 200,000. The majority of the population is Baluch, although there is a significant Pashtun population. The sandy desert of Dasht-e Margo covers a large portion of the province and there are scanty natural resources, such as mines and forests. Agriculture and livestock have been severely damaged by perpetual droughts over the past seven years. Illiteracy and high unemployment have forced many residents to seek employment in Iran and Pakistan. Three major rivers, the Helmand River, Khashrud River and Farahrud River, flow through the province and join together in Kang district. The lack of an effective irrigation system, however, has prevented the use of water from these rivers for agriculture or raising livestock. A major dam project designed in Charborjak district – Kamal Khan Dam – in the late 1970s was left half implemented after the Soviet invasion. If rebuilt, the dam could generate sufficient power and water for agriculture; however, its construction would require an agreement with Iran over the disputed waters of Helmand River. There is no Provincial Reconstruction Team (PRT) presence in Nimruz. The ANA 205th Corps has minimal presence there. The lack of security forces has made the province an unchecked conduit route for insurgents infiltrating into Afghanistan from Pakistan or for those coming from Arab countries through Iran into Afghanistan. In 2008, Iran expelled tens of thousands of Afghan refugees into Nimruz, adding to the instability in the province. Nimruz lies along the drug transit routes to Pakistan and Iran. According to the United Nations Office for Drugs and Crime (UNODC), 6,203 hectares of opium was cultivated in Nimruz in 2008. While a major eradication planned by the government in 2009 could decrease the cultivation level, the lack of development projects and alternative livelihood for the people could make the implementation of such a plan difficult. Day Kundi province was created in March 2004. The nine districts that make up Day Kundi used to form the northern part of Uruzgan province. Hazaras form the majority in Day Kundi province. Culturally and ethnically, Day Kundi is more closely related the province of Bamyan to its north (also inhabited by a majority of ethnic Hazaras) than its southern neighbors, Uruzgan and Helmand Province. Day Kundi is mountainous and receives slightly more rainfall than the rest of the south. The province is generally stable, although there are security problems in the southernmost districts of the province, Kirjan and Gizab. The ANA 205th Corps does not maintain forces in Day Kundi, however. The province is severely under-developed, with no public electricity available. Less than ten percent of roads are accessible yearlong. Only one paved road runs north to south through the province. Uruzgan is a small province in southern Afghanistan. Roughly half of the terrain is mountainous The province is divided into five districts. Prior to 2006, the province had four districts; however, in 2006 a Pashtun-dominated district was annexed by Uruzgan province after it split from the mostly-Hazara Day Kundi province.45 The province has a population of about 320,000 and most live in rural areas. The largest ethnic group is the Durrani Pashtun, but there is a significant number of Hazaras as well. The Taliban currently control about 60 percent of Uruzgan province, particularly in the rural areas, whereas the government has some control in the cities.46 Extortion and roadside violence make transportation throughout the province very difficult. Most non-governmental organizations do not venture into any of the districts on account of the security situation. Kamp Holland is the main ISAF military base in Uruzgan. The Netherlands is leading the ISAF forces in the province. Approximately 1,400 Dutch troops are stationed in Uruzgan. The Dutch forces are planned to remain in the province until 2010.48 The Dutch forces have been actively engaged in counterinsurgency operations in the South – unlike Germany, for example, which avoids combat action because of national caveats. Farming and raising livestock are the main occupations in the province.49 The province has one of the least developed infrastructure system in the country. Only eight percent of the population has access to electricity. There is one PRT in the province headquarted in the capital, Tarin Kowt. It is headed by the Netherlands. While the PRT has initiated numerous projects, the security situation has complicated its ability to follow through with projects. 1 Steve Coll, “Slowly, Slowly Sucked into It,” in Ghost Wars: The Secret History of the CIA, Afghanistan, and Bin Laden, from the Soviet Invasion to September 10, 2001 (Penguin, 2004) 280. 2 For Taliban’s emergence in Kandahar, see Ahmed Rashid, Taliban: Militant Islam, Oil and Fundamentalism in Central Asia (New Haven: Yale University Press, 2001). 3 “One Step Closer to a Brighter Future,” United States Agency for International Development (USAID), December 30, 2008. 4 “One Step Closer to a Brighter Future,” United States Agency for International Development (USAID), December 30, 2008. 5 Bill Samii, “Iran/Afghanistan: Still No Resolution For Century-Old Water Dispute,” Radio Free Europe/Radio Liberty, September 7, 2005. 6 Report on Iranian Vice President’s trip to Afghanistan, February 21, 2009. 7 Dexter Filkins, “Taliban Fill NATO’s Big Gaps in Afghan South,” The New York Times, January 21, 2009. 8 Dexter Filkins, “Taliban Fill NATO’s Big Gaps in Afghan South,” The New York Times, January 21, 2009. 9 John J. Kruzel, “Influx of U.S. Troops in Afghanistan to be Met With Rising Violence,” American Forces Press Service, March 20, 2009. 10 Dexter Filkins, “Taliban Fill NATO’s Big Gaps in Afghan South,” The New York Times, January 21, 2009. 11 Dexter Filkins, “Taliban Fill NATO’s Big Gaps in Afghan South,” The New York Times, January 21, 2009. 12 “Karzai's Advisor Complains from Kandahar Administration,” Quqnoos News Agency, March 2, 2009. 13 James Risen, “Reports Link Karzai’s Brother to Afghanistan Heroin Trade,” The New York Times, October 4, 2008. 14 Graeme Smith, “Kandahar governor said to be stepping down,” The Globe and Mail, December 3, 2008. 15 Carlotta Gall, “Governor of Afghan Opium Capital Pushes for Crop Replacement,” The New York Times, October 4, 2008. 16 Martin Patience, “UN reports Afghan opium decline,” BBC News, August 26, 2008. 17 Drew Brown, “Afghans Step Up Effort To Destroy Opium Fields,” Stars and Stripes, April 11, 2009. 18 Peter Griffiths, “Afghan 2008 opium crop was second biggest,” Reuters UK, February 19, 2009. 19 “ISAF Regional Command Structure,” International Security Assistance Force (ISAF) website, January 14, 2009. 20 Ann Scott Tyson, “Allies 'Out Of Troops' In Afghan South,” The Washington Post, March 21, 2009. 21 Ann Scott Tyson, “Allies 'Out Of Troops' In Afghan South,” The Washington Post, March 21, 2009. 22 “Karzai's Advisor Complains from Kandahar Administration,” Quqnoos News Agency, March 2, 2009. 23 Dexter Filkins, “Taliban Fill NATO’s Big Gaps in Afghan South,” The New York Times, January 21, 2009. 24 “Violence to 'spike' in Afghanistan: Dutch general,” Agence France-Presse (AFP), March 20, 2009. 25 United States Agency for International Development (USAID), "Afghanistan's Provinces," USAID: Afghanistan. 26 Ministry of Rural Rehabilitation and Development (MRRD) of Afghanistan, “Provincial Profile – Kandahar,” 1. 27 Ministry of Rural Rehabilitation and Development (MRRD) of Afghanistan, “Provincial Profile – Kandahar,” 11. 28 Naval Postgraduate School, “Kandahar Executive Summary,” Program for Culture and Conflict Studies. 29 Ministry of Rural Rehabilitation and Development (MRRD) of Afghanistan, “Provincial Profile – Kandahar,” 12. 30 Ministry of Rural Rehabilitation and Development (MRRD) of Afghanistan, “Provincial Profile – Helmand,” 2. 31 Ministry of Rural Rehabilitation and Development (MRRD) of Afghanistan, “Provincial Profile – Helmand,” 2. 32 Ministry of Rural Rehabilitation and Development (MRRD) of Afghanistan, “Provincial Profile – Helmand,” 11-12. 33 Tom Coghlan, ”Can Tribes Take on the Taliban?” BBC News, December 26, 2007. 34 Tom Coghlan, ”Can Tribes Take on the Taliban?” BBC News, December 26, 2007; Ministry of Rural Rehabilitation and Development (MRRD) of “Provincial Profile – Helmand." 35 “Afghanistan Remains World’s Largest Opium Producer,” Xinhua, March 28, 2009. 36 Jonathon Burch, “Keeping An Eye on the Taliban,” Reuters, March 30, 2009. 37 Ministry of Rural Rehabilitation and Development (MRRD) of Afghanistan, “Provincial Profile – Helmand,” 11. 38 Ministry of Rural Rehabilitation and Development (MRRD) of Afghanistan, “Provincial Profile – Helmand,” 7. 39 “Official: 70,000 addicts in Taliban hotbed of S Afghanistan,” Xinhua, April 13, 2009. 40 Dexter Filkins, “Taliban Fill NATO’s Big Gaps in Afghan South,” The New York Times, January 21, 2009. 41 “Afghan-Iran Highway Boosts Business,” Quqnoos News Agency, March 19, 2009. 42 “Afghan-Iran Highway Boosts Business,” Quqnoos News Agency, March 19, 2009. 43 Naval Postgraduate School, “Dai Kundi Executive Summary,” Program for Culture and Conflict Studies, p. 4. 44 Naval Postgraduate School, “Dai Kundi Executive Summary,” Program for Culture and Conflict Studies, p. 2; and Ministry of Rural Rehabilitation and Development (MRRD) of Afghanistan: Dai Kundy Provincial Profile. 45 Naval Postgraduate School, “Uruzgan Provincial Profile,” Program for Culture and Conflict Studies. 46 Naval Postgraduate School, “Uruzgan Provincial Profile,” Program for Culture and Conflict Studies. 47 Naval Postgraduate School, “Uruzgan Provincial Profile,” Program for Culture and Conflict Studies. 48 “Kamp Holland hit by missile attack,” Radio Netherlands, April 6, 2009. 49 Naval Postgraduate School, “Uruzgan Provincial Profile,” Program for Culture and Conflict Studies, p. 1. 50 Naval Postgraduate School, “Zabul Executive Summary,” Program for Culture and Conflict Studies, p. 1. 51 Naval Postgraduate School, “Zabul Executive Summary,” Program for Culture and Conflict Studies, p. 6. 52 Ministry of Rural Rehabilitation and Development (MRRD) of Afghanistan, “Provincial Profile – Zabul,” 10. 53Naval Postgraduate School, “Zabul Executive Summary,” Program for Culture and Conflict Studies, p. 6. 54 Naval Postgraduate School, “Zabul Executive Summary,” Program for Culture and Conflict Studies, p. 6. 55 Naval Postgraduate School, “Zabul Executive Summary,” Program for Culture and Conflict Studies, p. 6. 56 Jean Duggan, “Change of command for Zabul PRT,” Blackanthem Military News, March 22, 2008. 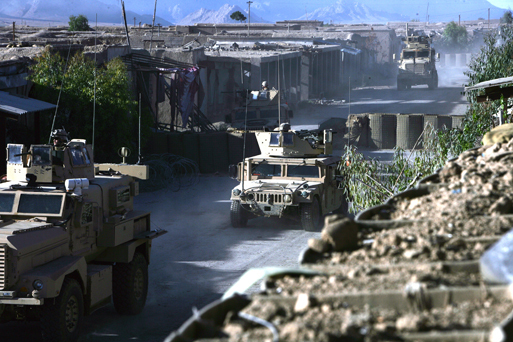 58 "ANSF Destroy Insurgent Route in Zabul,” Combined Joint Task Force – 101 Public Affairs, March 22, 2008. 59 “Combined Forces Kill 43 Militants in Zabul Province,” Soldier of Fortune, October 7, 2008. 60“ANSF, Coalition Forces further disable IED cells in Khowst and Zabul,” United States Central Command Public Affairs, February 6, 2009.